An international team of scientists has directly observed granules on the surface of a red giant star called π1 Gruis. Granules are patterns of convection currents in the plasma of a star. ESO astronomer Claudia Paladini led the international team of scientists that made the discovery. They used the Precision Integrated-Optics Near-infrared Imaging ExpeRiment (PIONIER), an instrument on the Interferometer of ESO’s Very Large Telescope, to achieve the discovery. This remarkable image from the PIONIER instrument reveals the convective cells that make up the surface of this huge star. π1 Gruis has about the same mass as the Sun. But is 350 times larger and several thousand times as bright. This cool red giant lies 530 light-years from Earth in the constellation of Grus (The Crane). The team of astronomers found that the surface (photosphere) of this star has just a few granules or convective cells. They are each about 75 million miles (120 million km) across. -Just one of these granules would extend from the Sun to beyond Venus. However, our Sun will swell to become a similar red giant star in about five billion years. By comparison, the Sun’s photosphere contains about two million convective cells, with typical diameters of just 932 miles (1,500 km). However, when π1 Gruis ran out of hydrogen to burn, it ceased the first stage of its nuclear fusion programme. Thus, shrinking as it ran out of energy, causing it to heat up to over 100 million degrees. Because of these extreme temperatures, the star began to fuse helium into heavier atoms such as carbon and oxygen. So, the intensely hot core then expelled the star’s outer layers, causing it to grow hundreds of times larger than its original size. 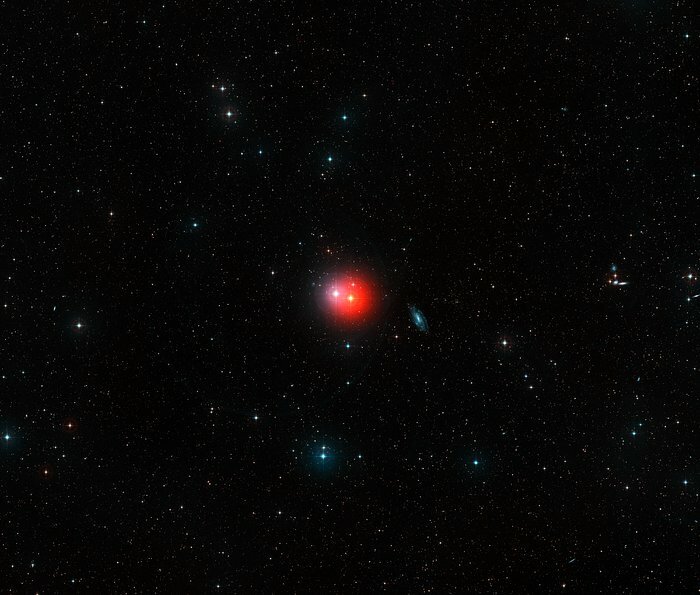 This colorful image shows the sky around the bright pair of stars π1 Gruis (center-right, very red) and π2 Gruis (center-left, bluish-white). Just right of center we can see the bright spiral galaxy IC 5201 and many other fainter galaxies. This is a wide-field image from the Digitized Sky Survey 2. Image credit: ESO / Digitized Sky Survey 2 / Davide De Martin. Stars more massive than 8 solar masses end their lives in dramatic supernovae explosions. But less massive stars like this one gradually expel their outer layers, resulting in beautiful planetary nebulae.